The 2006 James Bond film Casino Royale has its share of influences. Most obviously, the opening scene is reminiscent of Dr No, in which a seated Bond coolly shoots Professor Dent from the shadows. This scene was also shot in such a way as to evoke Cold War-era spy films such as The IPCRESS File and The Spy Who Came In From The Cold. Later in the film Bond runs through the streets of Venice, and there’s a deliberate reference to Nicholas Roeg’s Don’t Look Now as he catches sight of Vesper’s red coat. Many have pointed out that the film’s tougher, more realistic action scenes seem to have been stylistically inspired by the Jason Bourne films. And finally, the decision to ‘reboot’ the series showing Bond as a newly minted Double O agent was probably helped along by the enormous commercial success of Batman Begins, which showed the origins of that character with a darker edge following films many had felt veered too close to fantasy. This sounds like a lot of influences when listed, but for film-makers and film-goers alike they are easily absorbed. In my last post, Agents of Influence, I discussed Inception, a film some critics felt had been influenced by Alain Resnais’ Last Year At Marienbad, but which director Christopher Nolan claims not to have seen beforehand. But would it surprise us to learn that Nolan had seen The Matrix, The Godfather, Star Wars, Apocalypse Now, Psycho, 2001: A Space Odyssey, Strangers On A Train, The English Patient, The Third Man and dozens of other films, and that they might in some ways have been an influence on his work? Of course not. And one could no doubt add many more films to the list, for Nolan or any other film director working today. In that post, I also discussed a scene in the film of From Russia With Love in which James Bond is chased across barren countryside by a low-flying helicopter. 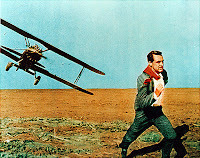 Terence Young, the director of From Russia With Love, has confirmed that this was inspired by the scene in North by Northwest in which Cary Grant’s character Roger Thornhill is attacked by a crop-duster. This would have been clear even if Young had not confirmed it, despite the scene in From Russia With Love featuring a helicopter rather than a crop-duster, because the two scenes share several precise and unusual elements. It would be easy to cite scenes in thrillers in which a character is shot at by villains while running away from them: that’s a very basic similarity. It would be much harder to cite scenes in which a man is being persistently shot at by an aircraft that swoops down on him while he runs across a barren landscape. And all such scenes would, I suspect, have been filmed after North by Northwest, and be directly or indirectly inspired by it. There’s no line in the sand about this sort of thing, but sometimes – as in this case – common sense tells us when something is directly influenced by something else. The influence of North By Northwest on this scene in From Russia With Love is fairly unimportant when we’re sitting back and watching the film – but it’s crucial if we want to assess the importance of the scene in modern cinema. If a critic were to claim that this scene was the most inventive and suspenseful action scene ever to have been filmed, omitting any reference to the Hitchcock film that inspired it, they would be completely mischaracterizing its place in the genre. When Ian Fleming sat down to write the first James Bond novel, Casino Royale, in January 1952, he was familiar with many thrillers that had come before. He had been reading thrillers since he was a young boy, and in articles, interviews and the novels themselves showed that he had a wide knowledge of the genre, as well as a passion for and deep understanding of it. Literary criticism of Fleming’s work has tended to focus on a very narrow band of inspirations, but the reality, I think, is that he was influenced by dozens of other writers, not just three or four. ‘Bond’s first impression was of thinness and erectness and height. Doctor No was at least six inches taller than Bond, but the straight immovable poise of his body made him seem still taller. The head also was elongated and tapered from a round, completely bald skull down to a sharp chin so that the impression was of a reversed raindrop, or rather oildrop, for the skin was of a deep almost translucent yellow. Several shared precise and unusual elements – and common sense – have led to many critics noting the similarities between Dr No and Dr Fu-Manchu. Fleming first came across Rohmer’s character at his prep school, Durnford’s, where he and the other boys were read stories by the headmaster’s wife every Sunday evening. According to Fleming biographer Andrew Lycett, the favourites among the boys were The Prisoner Of Zenda by Anthony Hope, Moonfleet by J. Meade Falkner and, ‘towards the end of Ian’s time, Bulldog Drummond’. 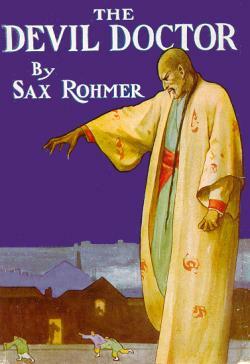 Of these, Fleming ‘preferred the populist works of Sax Rohmer, who opened up a more fantastic world with his “yellow devil” villain Dr Fu Manchu.’3 Literary tastes at English boarding schools move at a slow pace, it seems, as I was also read Sapper’s Bulldog Drummond and Moonfleet at prep school in the 1980s, while The Prisoner of Zenda and similar 19th-century adventure stories were staples of the library at my public school. 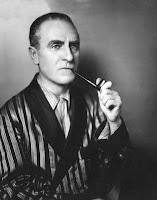 The influence of juvenile fiction on Fleming is rarely discussed, even though the two writers who are most often cited as his major inspirations, Sapper and John Buchan, were first read by him at school, and mainly appeal to schoolboys. James Bond, of course, also appeals to a good many teenage boys. Fleming acknowledged the influence, though, mentioning his schoolboy reading in several interviews. 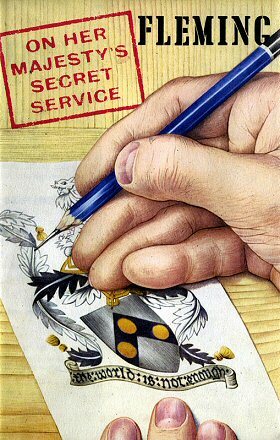 He also acknowledged it privately: in April 1953, when Somerset Maugham wrote him a letter praising Casino Royale, Fleming replied thanking him profusely for ‘the kind things you say about these leaves from a Cosh-boys own paper’.4 This was an ironic – and telling – reference to The Boy’s Own Paper, a monthly publication that had been launched in the 19th century to provide thrilling adventures for teenage boys, and which was still going strong at the time. A ‘cosh-boy’ was a slang term for a delinquent teenager. 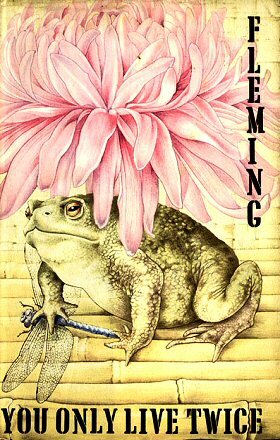 Fleming was being falsely modest, but he was also making an interesting point: his debut novel was much more violent and adult in themes than Boy’s Own stories, but it nevertheless recognizably related to that tradition. In 1950, The Times reported on a small experiment.5 For seven years, one Martin Parr studied the reading habits of 150 boys who attended a club in Shoreditch, aged between 14 and 18 and drawn from grammar schools, central schools and senior schools. This was a very small sample, but I think it’s nevertheless revealing about the climate leading up to the publication of Casino Royale. Some of the more popular authors included Jules Verne, John Buchan, Baroness Orczy, Robert Louis Stevenson, GW Henty, Rider Haggard, Erskine Childers, Dorothy Sayers, Mark Twain and Sidney Horler. But the most popular were Arthur Conan Doyle, Richmal Crompton, Sapper, Peter Cheyney, WE Johns and, ‘the king of books’, Leslie Charteris’ The Saint series. Some of these writers’ creations have endured: Sherlock Holmes, Biggles, The Saint, Huckleberry Finn and Lord Peter Wimsey are all seen as iconic characters of popular fiction, even if the books are not as widely read as they once were. Others rest in the drawer marked ‘forgotten favourites’, and among these I would include Bulldog Drummond, Raffles, Just William and Allan Quatermain – adventures featuring these characters are read by few today, but their names are still widely recognized, as is their influence. Some of the others, such as Sidney Horler’s Tiger Standish, have all but vanished from the popular lexicon. But there was nevertheless something about Rohmer’s ruthless Oriental villain that captured readers’ imaginations, and Fu-Manchu would go on to feature in dozens of stories, films and radio shows. Imitators sprung up very quickly. 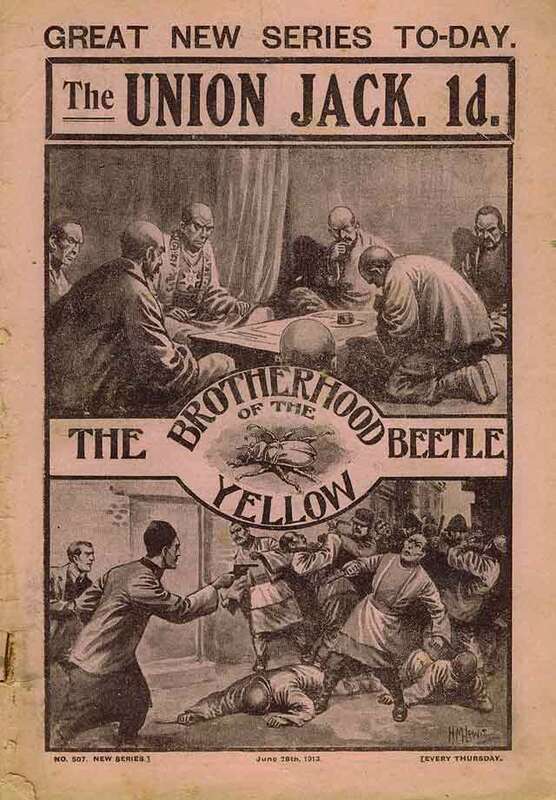 On June 28 1913, just two days after the first Fu-Manchu adventure was published in book form, The Union Jack began a new Sexton Blake series, The Brotherhood of the Yellow Beetle, in which the detective battled a Chinese mastermind called Prince Wu Ling. Sexton Blake had himself originated in a similarly opportunistic manner: on December 6 1893, Arthur Conan Doyle’s story The Final Problem was published in The Strand, and concluded with Sherlock Holmes appearing to die after disappearing over the Reichenbach Falls with Professor Moriarty. On December 13, The Halfpenny Marvel published The Missing Millionaire, the cover of which showed two men fighting each other as they fell over a waterfall, with the subtitle ‘The Story of a Daring Detective’. This was the first story to feature Sexton Blake. In The Brotherhood of the Yellow Beetle, Wu Ling sends Blake and others poisonous yellow beetles to cause them harm, just as Fu-Manchu sends Sir Denis Nayland Smith and others centipedes. Rohmer is one of the few writers Fleming named as an influence on his work. 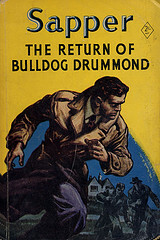 Another is Henry ‘Sapper’ McNeile, whose Hugh ‘Bulldog’ Drummond novels he had also been read at Durnford’s. Drummond, a tough former soldier looking for adventures in peacetime, battled several villains, but the first and most impressive of them was Carl Peterson, a suave master of disguise assisted by a mysterious woman called Irma, who sometimes posed as his daughter but who seemed more like his mistress. Fleming’s master-villain Ernst Stavro Blofeld was also assisted by a woman called Irma. Even had Fleming not acknowledged Sapper as an influence, this is too unusual a name for a character with such a position plausibly to be anything other than a direct reference to Sapper’s novels. ‘I stifled a cry that rose to my lips; for, with a shrill whistling sound, a small shape came bounding into the dimly lit vault, then shot upward. A marmoset landed on the shoulder of Dr. Fu-Manchu and peered grotesquely into the dreadful yellow face. The Doctor raised his bony hand and fondled the little creature, crooning to it. Hard beside me I heard Nayland Smith groan, Weymouth had become suddenly silent. For my own part, I could have shrieked in pure horror. FOR I KNEW WHAT WAS COMING. I realized in one agonized instant the significance of the dim lantern, of the careful progress through the subterranean fungi grove, of the care with which Fu-Manchu and his servant had avoided touching any of the growths. I knew, now, that Dr. Fu-Manchu was the greatest fungologist the world had ever known; was a poisoner to whom the Borgias were as children – and I knew that the detectives blindly were walking into a valley of death. Then it began – the unnatural scene – the saturnalia of murder. Like so many bombs the brilliantly colored caps of the huge toadstool-like things alluded to by the Chinaman exploded, as the white ray sought them out in the darkness which alone preserved their existence. A brownish cloud – I could not determine whether liquid or powdery – arose in the cellar. “Observe the symptoms of delirium, Doctor!” Out there, beyond the glass door, the unhappy victims were laughing – tearing their garments from their bodies – leaping – waving their arms – were become MANIACS! “They die like flies!” screamed Fu-Manchu, with a sudden febrile excitement; and I felt assured of something I had long suspected: that that magnificent, perverted brain was the brain of a homicidal maniac – though Smith would never accept the theory. It’s not hard to see the influence on Ian Fleming here: a megalomaniacal super-villain wields great knowledge in a sadistic and elaborate fashion, and the scene is described in vivid, baroque and frightening prose. There are no passages in the works of John Buchan, Dornford Yates or Leslie Charteris remotely like this. There are passages somewhat like this in Sapper – because Rohmer was one of Sapper’s chief influences. ‘Now my sight was restored to me, and looking back along the passage, I saw, clinging to an irregularity in the moldy wall, the most gigantic scorpion I had ever set eyes upon! It was fully as large as my open hand. Kennedy and Nayland Smith were stealthily retracing their steps, the former keeping the light directed upon the hideous insect, which now began running about with that horrible, febrile activity characteristic of the species. Suddenly came a sharp, staccato report... Sir Lionel had scored a hit with his Browning pistol. In waves of sound, the report went booming along the passage. The lamp, as I have said, was turned in order to shine back upon us, rendering the tunnel ahead a mere black mouth – a veritable inferno, held by inhuman guards. Into that black cavern I stared, gloomily fascinated by the onward rolling sound storm; into that blackness I looked… to feel my scalp tingle horrifically, to know the crowning horror of the horrible journey. The blackness was spangled with watching, diamond eyes! – with tiny insect eyes that moved; upon the floor, upon the walls, upon the ceiling! A choking cry rose to my lips. Around we all came, panic plucking at our hearts, around swept the beam of the big lamp; and there, retreating before the light, went a veritable army of venomous creatures! I counted no fewer than three of the giant red centipedes whose poisonous touch, called “the zayat kiss,” is certain death; several species of scorpion were represented; and some kind of bloated, unwieldy spider, so gross of body that its short, hairy legs could scarce support it, crawled, hideous, almost at my feet. They turn out to be giant tarantulas. Rohmer’s influence can also be seen in You Only Live Twice, which features a ‘Garden of Death’ filled with toxic plants, snakes, scorpions and spiders, and poisonous fish in its ponds. He stepped back a pace and stood rigid, staring at the spot from which the sound had seemed to come – but he could see nothing. Then he leaned forward and once more moved the curtain. Instantly it came again, sharper and angrier than before. Hugh passed a hand over his forehead and found it damp. Germans he knew, and things on two legs, but what was this that hissed so viciously in the darkness? At length he determined to risk it, and drew from his pocket a tiny electric torch. Holding it well away from his body, he switched on the light. In the centre of the beam, swaying gracefully to and fro, was a snake. For a moment he watched it fascinated as it spat at the light angrily; he saw the flat hood where the vicious head was set on the upright body; then he switched off the torch and retreated rather faster than he had come. Peterson doesn’t have a pet marmoset, but like Fu-Manchu he keeps a primate: a gorilla (with which Drummond grapples). ‘What looked like a reed was slowly inserted through the opening between door and doorpost! It was brought gradually around… until it pointed directly toward me! I seemed to put forth a mighty mental effort, shaking off the icy hand of fear which held me inactive in my chair. A saving instinct warned me – and I ducked my head. Something whirred past me and struck the wall behind. Revolver in hand, I leapt across the room, dashed the door open, and fired blindly – again – and again – and again – down the passage. And in the brief gleams I saw it! I cannot call it man, but I saw the thing which, I doubt not, had killed poor Deeping with the crescent-knife and had propelled a poison-dart at me. It was a tiny dwarf! Neither within nor without a freak exhibition had I seen so small a human being! A kind of supernatural dread gripped me by the throat at sight of it. As it turned with animal activity and bounded into my bathroom, I caught a three-quarter view of the creature's swollen, incredible head – which was nearly as large as that of a normal man! Never while my mind serves me can I forget that yellow, grinning face and those canine fangs – the tigerish, blazing eyes – set in the great, misshapen head upon the tiny, agile body. ‘Every nerve in my body seemed to be strung tensely. I was icy cold, expectant, and prepared for whatever horror was upon us. One thin, brown hand appeared over the edge of the lowered sash, which it grasped – and then another. The man made absolutely no sound whatever. The second hand disappeared – and reappeared. It held a small, square box. There was a very faint CLICK. “Stand still, for your life!” came Smith’s voice, high-pitched. These things I realized in one breathless instant; in the next – Smith had dashed the thing’s poisonous life out with one straight, true blow of the golf club! ‘With the paper-knife he prised open the lid, and even he gave a startled exclamation when he saw what was inside. Personally it filled me with a feeling of nausea, and I saw Toby Sinclair clutch the table. This scene, which is too long to quote here, is a virtuoso piece of writing from Fleming, with his powers of description at full throttle. He takes this rather stale convention and prolongs the visceral reaction for much longer than Rohmer or Sapper. Their prose is vivid, occasionally even chilling, but this is a rare example of suspense in Fleming, with time almost seeming to slow down, and his eye zooming in on every hair of the centipede’s legs as it traverses across Bond’s body. In the film adaptation, ironically, the centipede became a spider, the latter being thought more visually impressive. Fleming drew on the work of both Sapper and Rohmer in Thunderball, On Her Majesty’s Secret Service and You Only Live Twice. The master-villain of those three novels, Ernst Stavro Blofeld, is directly inspired by both Carl Peterson and Dr Fu-Manchu. Like Peterson, he changes identity and appearance, transforming himself into the Comte de Bleuville and Dr Shatterhand (Peterson poses as the ‘Comte de Guy’ and many others). Like Peterson, he is a highly organized criminal trying to alter world events primarily for profit; and like Peterson he makes use of biological warfare to do it, among other schemes. These are specific similarities, but they were not all that unusual in thrillers before Fleming. The combination of them is more telling, and coupled with Blofeld having a female accomplice called Irma this confirms Sapper as a direct source. I suspect Fleming called her that to make the inspiration more obvious, and perhaps to pay tribute to Sapper. Bond manages to best Blofeld in the sword fight, in a chapter titled ‘Blood and Thunder’, which was a phrase often used to describe boys’ adventure stories and similar tales from the late 19th century onwards. Reading such speeches in isolation, it’s hard to tell if it’s Blofeld speaking, or Dr No – or Fu-Manchu. The ‘mocking, lecture-room voice’ and megalomaniacal rhetoric of Fleming’s villains has its origins in Rohmer’s work. Although Fleming first encountered Rohmer as a boy, it seems he may have kept up with the series as an adult. One bizarre similarity comes in the story Green Devil Mask, which was serialized in the Canadian publication Star Weekly in January and February 1952. In it, Nayland Smith stops a plot by Fu-Manchu and his daughter to turn the gold bullion in Fort Knox into a worthless base metal using a new type of X-ray. This may simply be an uncanny coincidence because in Goldfinger, published in 1959, the titular villain merely wants to rob Fort Knox of its gold. But when it came to making the film of the novel a few years later, the scriptwriters felt that this didn’t work, and changed the plot so that Goldfinger plans to irradiate the gold in Fort Knox, rendering it worthless for decades. A novel that seems very likely to have influenced Ian Fleming directly is The Island of Fu Manchu, which was published in 1941. Fu Manchu has set up a sisal mine in Haiti using cheap labour, having frightened the locals by the fraudulent use of voodoo. The mine is a diversion: inside a hollowed-out volcano, Fu Manchu operates a secret base in which he keeps experimental underwater craft that will help tip the balance of world power. He captures Denis Nayland Smith and Bart Kerrigan, and threatens to throw them in a massive swamp, which contains Burmese soldier spiders. This sounds like a James Bond adventure taken to the extreme. In Live And Let Die, Mr Big – described by Antony Boucher in his review of the novel for The New York Times as ‘a sort of blackface Fu Manchu’20 – uses voodoo to frighten locals in Jamaica into submission. Dr No features a guano mine on Crab Key, and No uses cheap local labour to build his base. A base in a hollowed-out volcano was used by Blofeld in the film of You Only Live Twice, but not in Fleming’s novel, where Blofeld operated from a castle. Rohmer not only provided elements that Fleming built on to create what we now recognize as his style: in many ways, Fleming toned down those elements, and despite Rohmer’s lack of convincing characterization and archaic prose style, his work often seems more in line with the popular perception of James Bond stories than Fleming’s own novels. A significant difference between Fleming and Rohmer is their protagonists: James Bond is a very different character from the anodyne Denis Nayland Smith and his assorted accomplices. The Bentley-driving Bulldog Drummond is more similar to Bond, although I think there were several closer models. But Fleming’s villains – their conspiracies, strategies, ways of working, manner of speaking and treating others – as well as the locations and overall tone of his novels, all owe a lot to Rohmer’s work. Rohmer was a very prolific author, and it would take much more space to do justice to this topic, but I hope this article has at least gone some way to showing that he was a major source of inspiration for Ian Fleming – and often a very direct one. 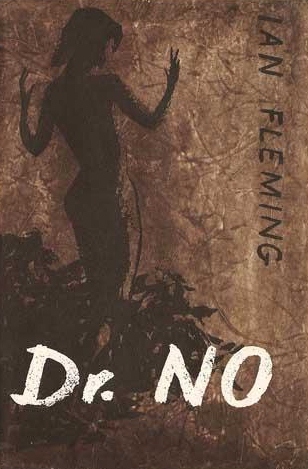 2. p127, Dr No by Ian Fleming, Pan, 1965. 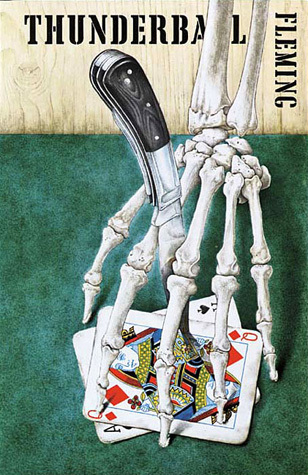 3. p10, Ian Fleming by Andrew Lycett, Phoenix, 1996. 4. pp239-240, The Life of Ian Fleming by John Pearson, Companion Book Club, 1966. 5. What Boys Read, The Times, February 15, 1950. 6. p210, Bloody Murder: From the Detective Story to the Crime Novel by Julian Symons, Viking, 1985. 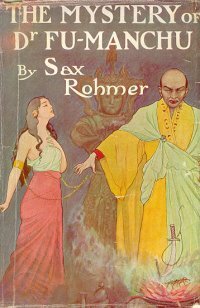 9. p176 The Hand of Fu-Manchu (American title) by Sax Rohmer, Borgo Press, Wildside Press edition, 2001. 10. pp209-210 The Hand of Fu-Manchu. 12 pp67,68 Bulldog Drummond by Sapper, House of Stratus, 2001. 13. pp20-21, The Quest of The Sacred Slipper by Sax Rohmer, Borgo Press, 2002. 16. pp60-61 The Final Round by Sapper, House of Stratus, 2009. 18. p192 The Devil Doctor by Sax Rohmer, BiblioBazaar, 2007. 19. pp170-171, You Only Live Twice by Ian Fleming, Pan, 1966. 20. Criminals At Large by Anthony Boucher, The New York Times, April 10, 1955.